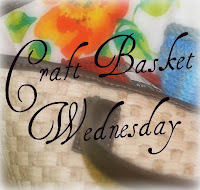 I thought, since I do have a little something I am working on, that it would be fun to participate in Amy's Craft Basket Wednesday again today. However, it looks like Amy and I are up to the same thing this week, making Lenten Calendars! There are so many great ideas out there for making Lenten calendars (Charlotte always makes really nice ones!) but our family has been making the same type of calendar each year since Lent of 2005, when Captain was only four years old, and it has become a much loved tradition in our home. I originally found the idea and directions in Guiding Your Catholic Preschooler and have posted about ours here and here. I still have a little time to finish the calendar, though not much! Can you believe that Lent begins NEXT WEEK!!! Have you started making plans for Lent? I have made the same calendar in year's past, Jessica. It's a nice one. I did something a little different last year. But, honestly, I haven't thought much about Lent yet this year =( I am grateful for the little reminders in Blogworld that Lent is right around the corner. What are we going to do? I have one week, so hopefully I will be able to get some things together. We made one this year and it is hanging on the wall already. I'm feeling very prepared this year, opposed to years past. The kids are loving ours already. I need to get some nice letter templates, sigh. That would make mine look so much nicer, lol. Can't wait to your finished one! Oh! And I have a cold too.... good times... hope you get better soon!!! I love this idea, and I think I will take a little time this week to put a calender together for our family. Thanks for the post! I'm stealing one of Charlotte's ideas this year ;) It's too cute! Where do you get your stickers? I can't seem to find any good ones around here. Thanks for the prompting. I need to get started. I print the font I like via my computer, trace/emboss the letters unto the card-stock/paper of my choice, and then cut them out. Maybe I'll take pictures of this process and post. I have to start ours yet. I find it imposssible to get lovely stickers here though. I will just have to improvise. I started on our "40 Bags for 40 Days"...3 bags of donations and 1 bag of trash...so far. And I have our books to read through Lent and into Easter. But, looking at Charlotte and your calendars (cuz I'm feeling more inspired) I may pick up some supplies and do something like those for our family. Then there still is the Jesus Tree that still needs to be put together...yikes! Everything will be on hold until Monday though (we are off for the long weekend) so I shall check in on the blog world to see what else inspires our Lent. Where did you find or cut your letters for the calendar? I'm thinking you used some type of cutting machine...like those for scrapbooking pages. I cut our letters out using my friend Marci's Cricut. It is SUCH a neat little machine and I would love to get one someday. We borrowed it recently for the boys to cut out "Maryland" and the names of the next few states they'll be studying. It sure makes it easy, but for many years I just cut the letters out by hand or wrote directly onto the Calendar. Kelly ~ I love these stickers! I purchased about 20 sets of them a few years ago on clearance. They are made by Trademark Stationary. Oh and Gae, I always tend to use a few stickers on our calendar since I have them, but I also use images from online! The options are endless and the images are so easy to resize, print out and then glue onto the calendar, in place of stickers. I also made a version of the Lent Calendar based on 'Guiding your Catholic Preschooler' when my daughter was 4 but last year I made Karen Edmistens Lamb of God calendar and my kids really loved it. They've already asked if we can do it again this year, so I guess that will be our family's tradition! Here's the link to Karen's if anyone is interested in checking it out. I love getting book ideas from your sidebars/links. Of the Easter books you have listed there, which one(s) appeal most to your littlest ones? My daughter is about your Snuggles' age, and I would like to begin building our collection of Easter books, but also want to get something that she will like now. Any suggestions?